The Fed, which appears genetically incapable of seeing bubbles until afterwards, must be seeing this: stock market margin debt relentlessly spiking into the stratosphere. Leverage is a sign of investor confidence – and at a certain level, exuberance. It’s the great accelerator. On the way up. And on the way down. In September 1987, margin debt peaked at $44 billion on the New York Stock Exchange, or 0.88% of GDP. In August, the stock market topped. On October 19, it crashed. Brokers made margin calls, and their clients had to sell into the crash. Forget limit orders. Sell orders were executed “at market.” It turned into a plunge on margin-call steroids. 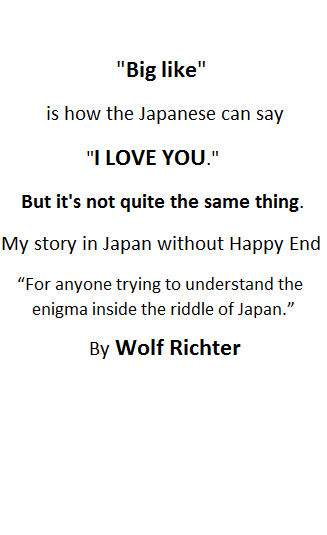 It ended in tears. 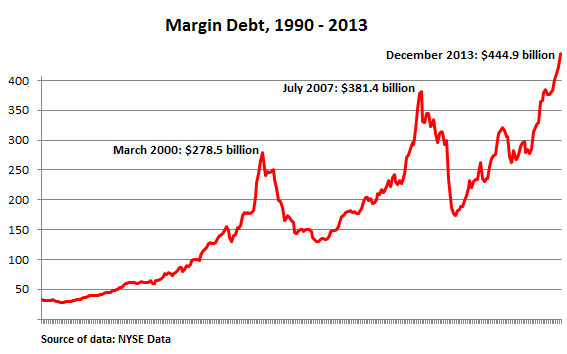 In March 2000, margin debt hit a record of $278.5 billion, or 2.66% of GDP. It was the month the dotcom bubble blew up. After 28 months of waves of forced selling, interrupted by vicious sucker rallies, the S&P ended down 45%, the Nasdaq nearly 80%! In July 2007, margin debt soared to $381.4 billion, or 2.60% of GDP. The market peaked in October then crashed in a breathtaking manner, spurred on by tsunamis of forced selling, including by the meanwhile ubiquitous hedge funds, that took the S&P 500 down 57%. In December 2013, margin debt jumped $21.2 billion to $444.9 billion, the NYSE reported. A spike? In the five months from August through December it soared $62 billion, more than in the prior four years combined ($45 billion). It reached 2.65% of GDP, the highest since March 2000. As predictor of a crash, margin debt is between crummy and lousy. No one knows if that stratospheric level at the end of December was the peak, until afterwards. But if there is a sharp downturn, a record level of leverage always triggers margin calls and bouts of forced selling, which drives stocks down further and triggers another bout of forced selling, and so on, in a high-speed, self-reinforcing loop, and all heck breaks loose. Getting margin calls when all your stocks are crashing at the same time, and liquidity has evaporated for the smaller ones where there are suddenly no buyers, and where you have to dump your blue chips because those are the only ones you can dump, though they’re the ones that would survive the crash the best – that’s the margin-debt nightmare. Record levels of margin debt turn a plain selloff into a crash. That margin debt of 2.65% of GDP in December represents only the level reported by brokers at the NYSE. It measures only a fraction of total leverage in the stock market. That total leverage is much higher – including what hedge funds, some of the largest players in the market, borrow in the shadow banking system. When it all unravels, hang on for a rough ride. The Fed must have been seeing it too. Stock market leverage was exactly what it wanted, in line with its policy of pushing even retirees, after stealing their livelihood, out to the thin end of the risk limb. Inflating asset values was its goal. “Wealth effect,” the Fed called it. But now risks and leverage in the system have taken on enormous proportions. It already warned about the record level of leveraged loans to over-indebted companies with junk credit ratings, and it warned about leverage in the shadow banking system, and it warned about other risks piling up. And it voted: taper-lite continues. That it was a unanimous decision gave it a come-heck-or-high-water aura. It’s not worried about the giant sucking sound coming from the emerging markets. That’s their problem. But it IS worried about the side effects of five years of relentless QE, and their threat to financial stability in the US. That includes the ballooning levels of stock market leverage. It said so in its prior policy meeting [Plagued By QE Indigestion, Fed Issues Asset-Bubble Warning].